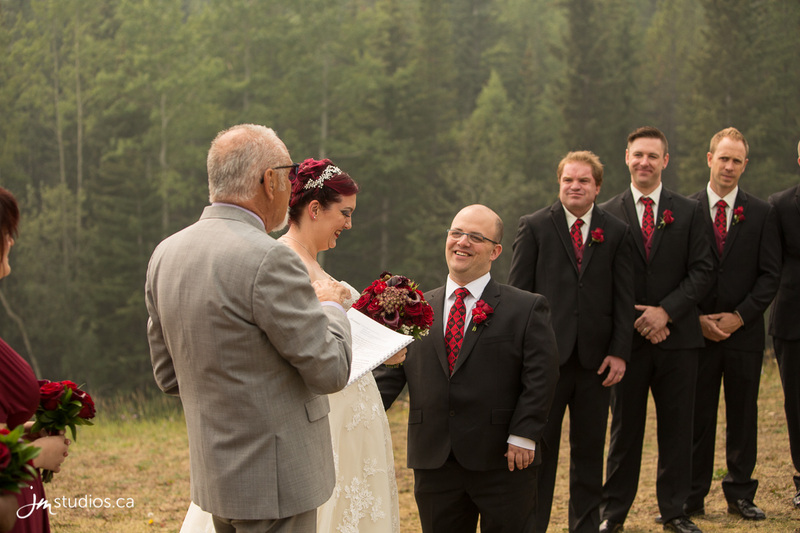 We started the day of Erica and Stewart’s wedding at the newly renovated Pomeroy Kananaskis Mountain Lodge in the heart of the Rockies. 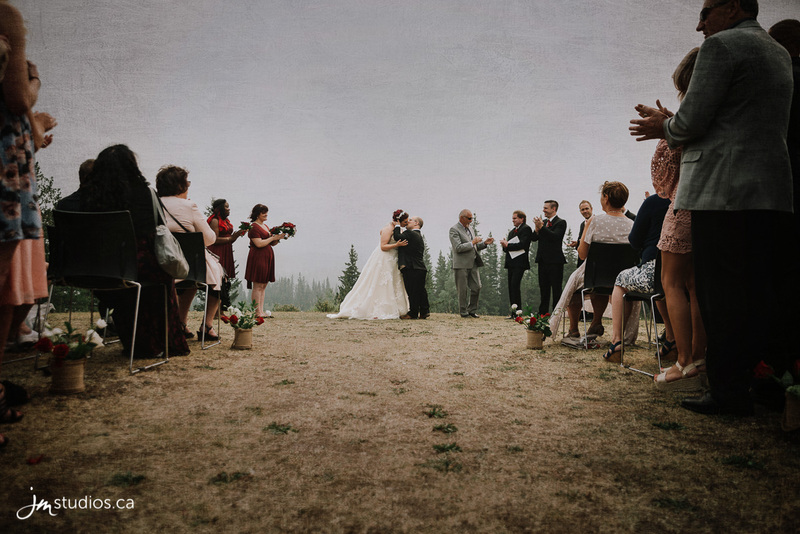 The Lodge is a blend of rustic backcountry lodge and luxury, making it a perfect place for a Canadian Mountain wedding! 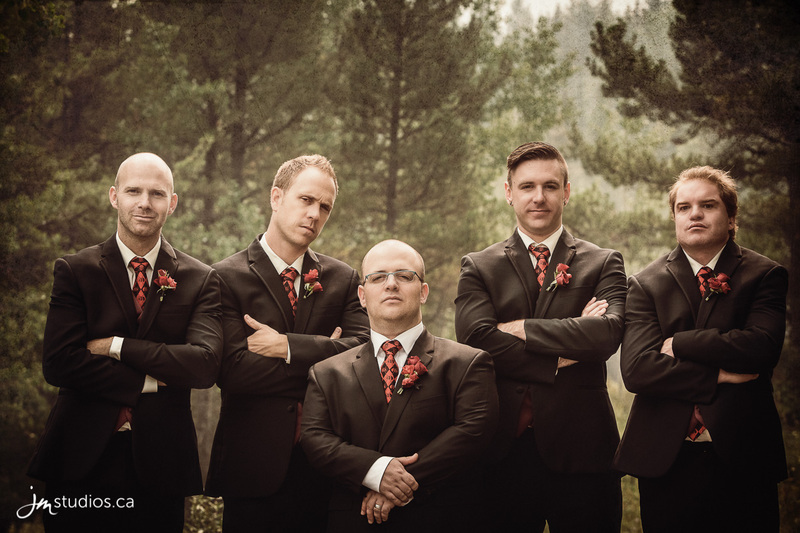 We met up with the groom and his groomsmen first, who had come in from camping nearby. The best man, Jesse, hosted the morning in his room. 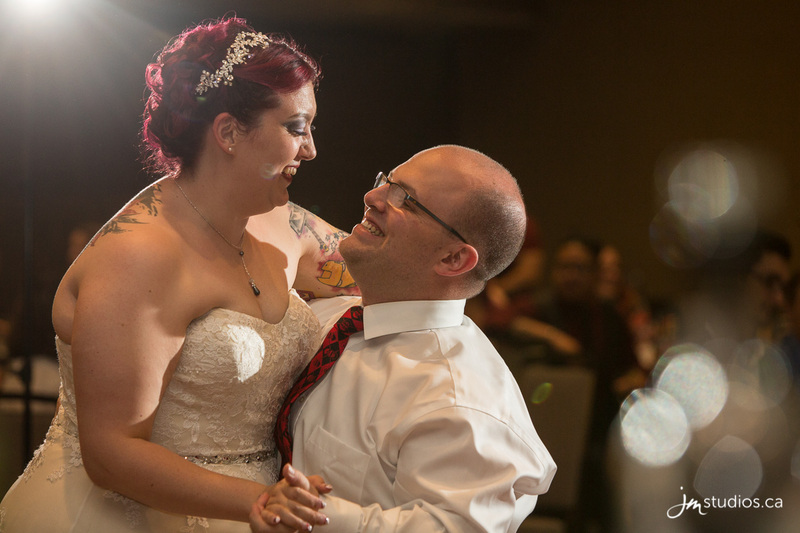 He and the groom have known each other since they were 15 years old, and have been side by side for many of life’s big moments. 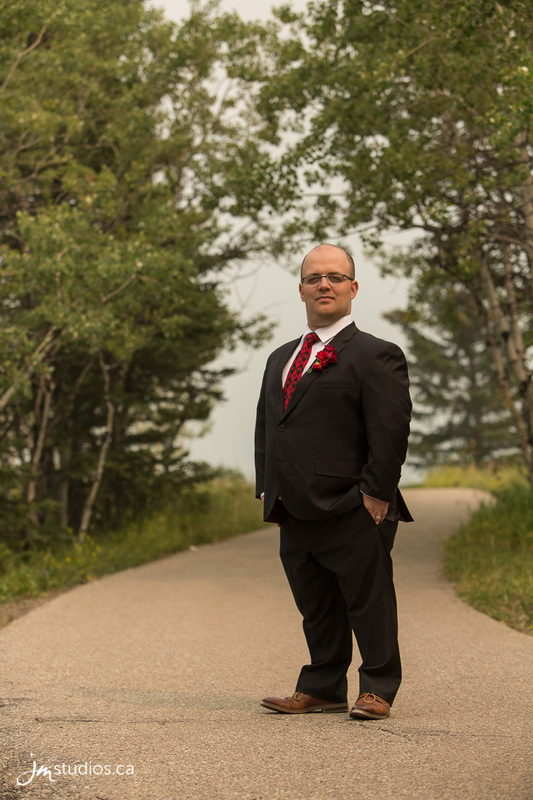 After a hot shave, the groom got into his suit, Batman socks, and Batman tie. Erica is a huge comic book fan, and loves the DC Universe, specifically Batman and Harley Quinn. So, they utilized these pop culture symbols throughout the day, from socks, ties, and shoes to party gifts and favours. 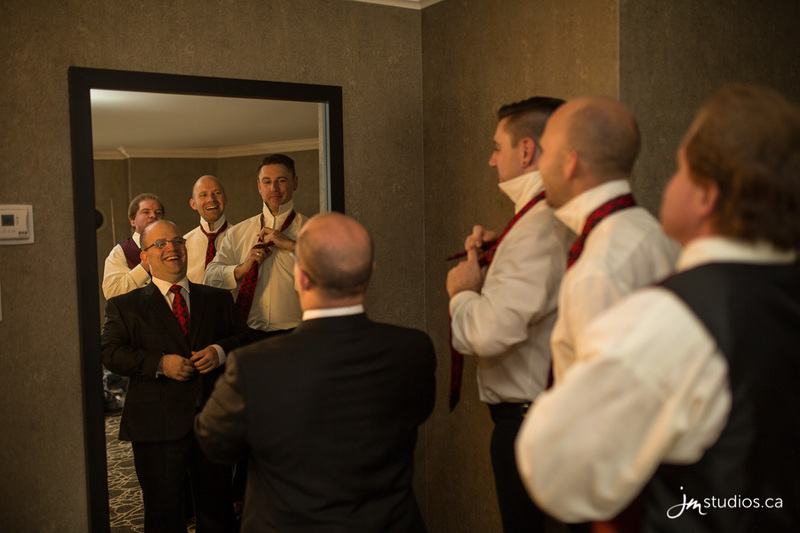 Stewart gifted his groomsmen with Batman ties, paraphernalia, and a Superman money clip. 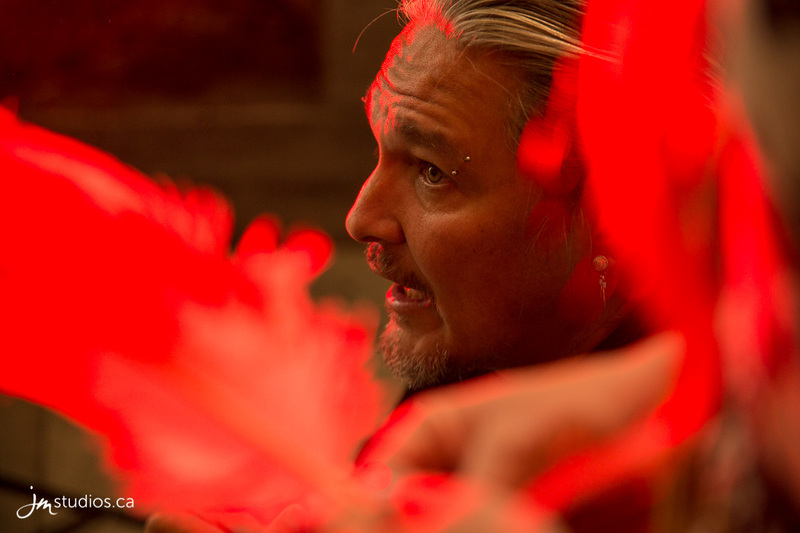 The theme colour was a vibrant red, reminiscent of comic books. 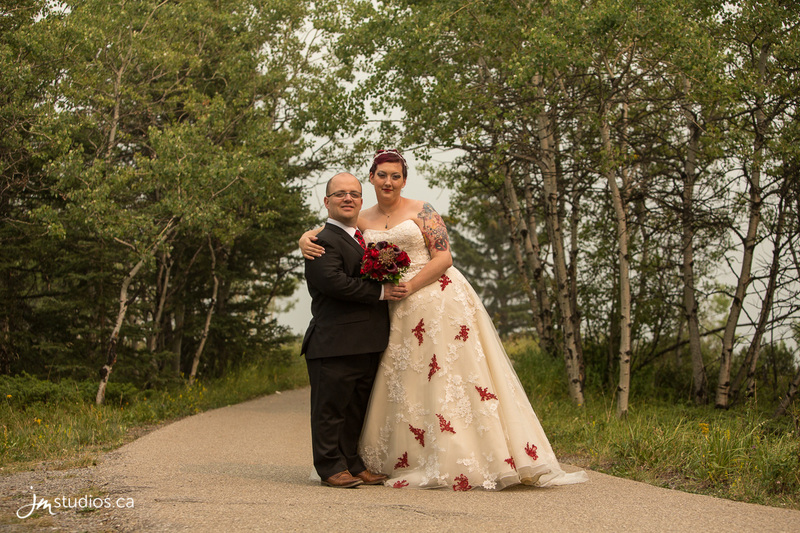 To top it off, Erica even had red bats embroidered into her wedding dress! 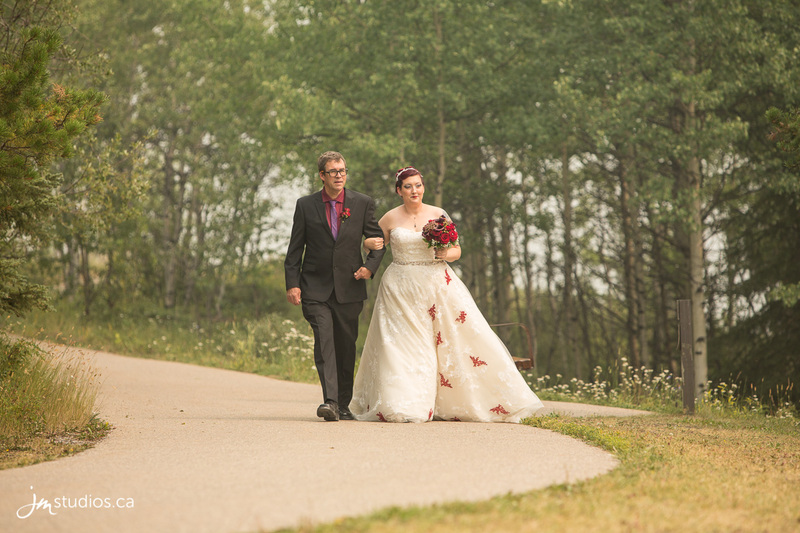 We left the guys and headed up to see the beautiful bride. Up in the honeymoon suite, the girls had just finished with makeup. 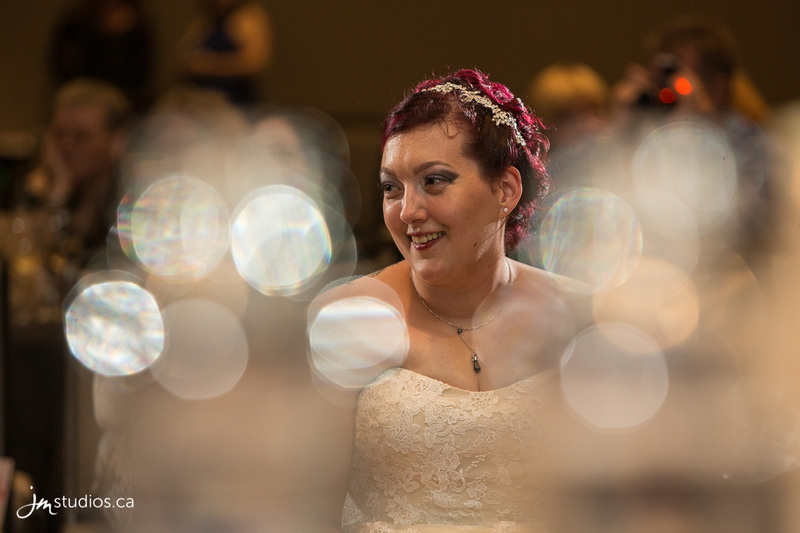 The large, two-floor suite looked out onto the Rockies, giving us some great spots to photograph the bridal party. 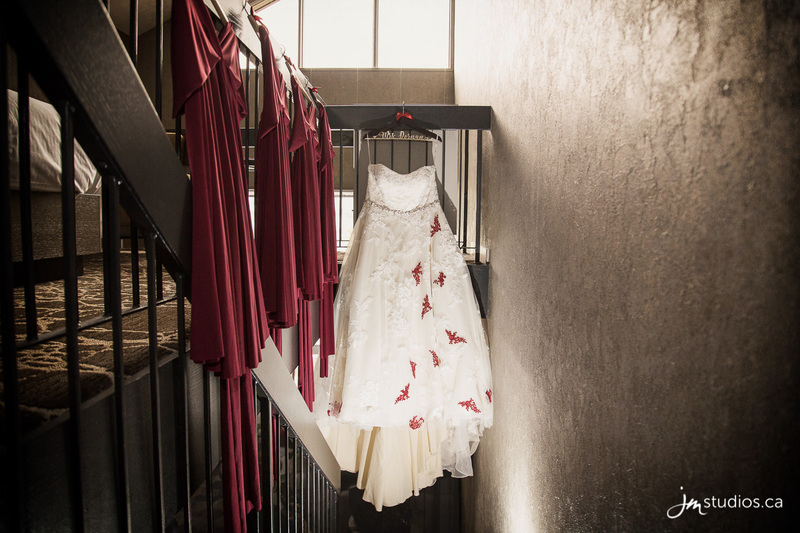 We began with Erica’s dress, which hung from a custom hanger, with the name “Mrs. Dornan” underneath it. In fitting with the theme, Erica had coloured her hair a deep red, matching the crimson bats in her dress. 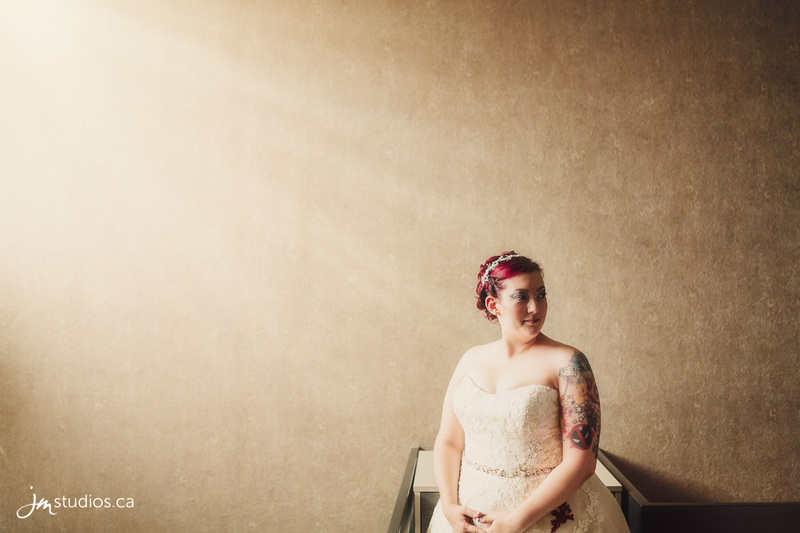 It looked excellent against the bright white of her wedding gown. She also had hangers made for each of her bridesmaids, inscribed with their names too. 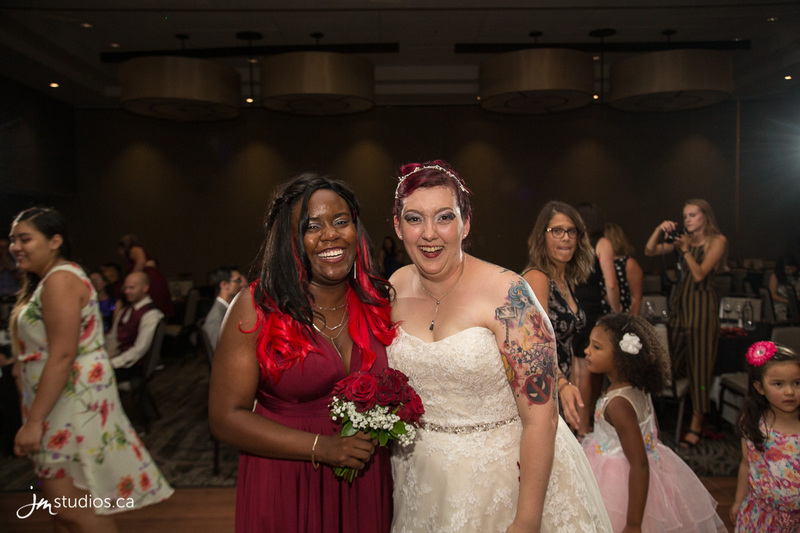 We photographed the girls in their matching, personalized robes, as they opened their gifts of Harley Quinn makeup bags, also embroidered with their initials. 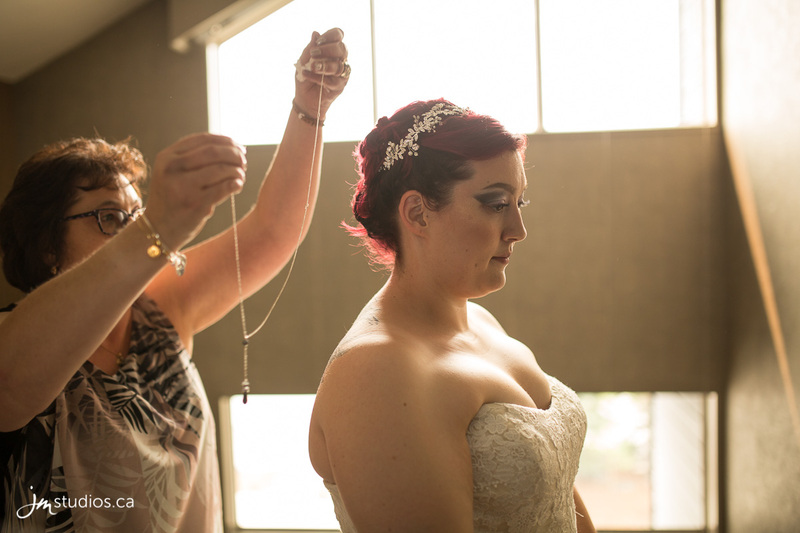 Afterward, they all changed into their dresses, and Erica’s mom came in to help her with her jewellery. 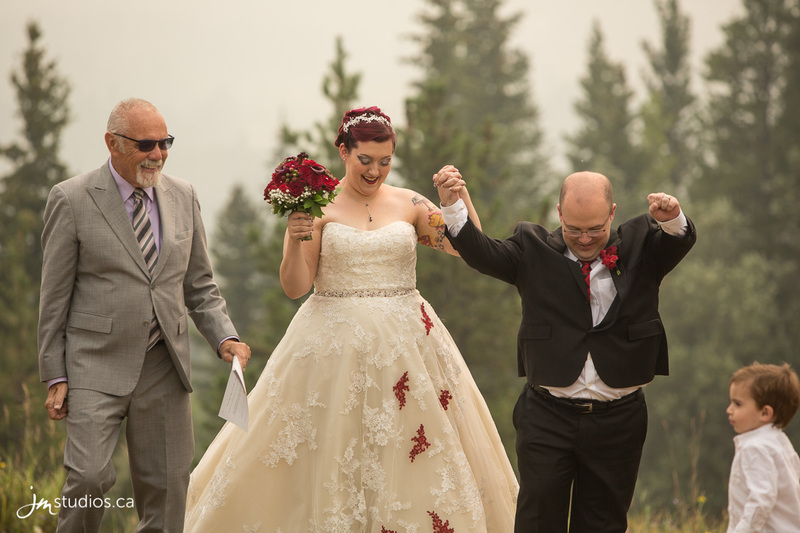 After photographing the bride, her bridesmaids, and the adorable bouncy flower girl, we headed down to Viewpoint 5, where officiant Jerry Stilson was setting up for the ceremony. 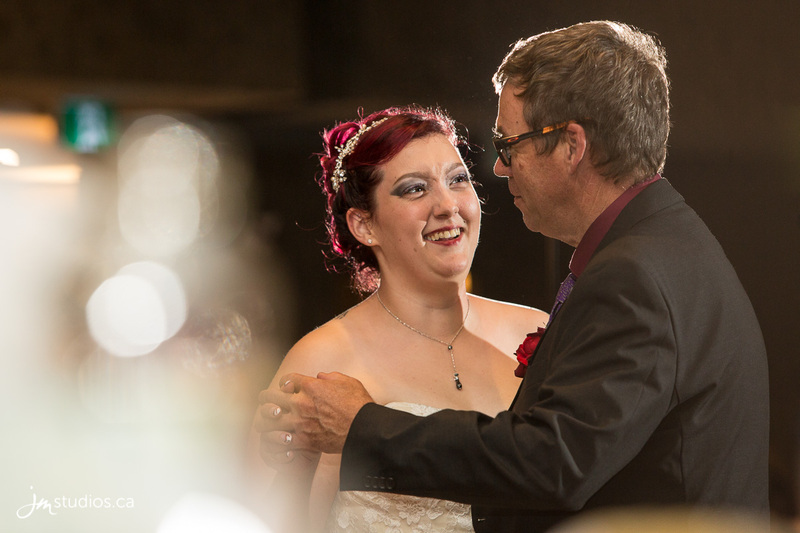 Stewart is a man who wears his heart on his sleeve, so when his beautiful bride appeared, he wiped a tear from his eye. 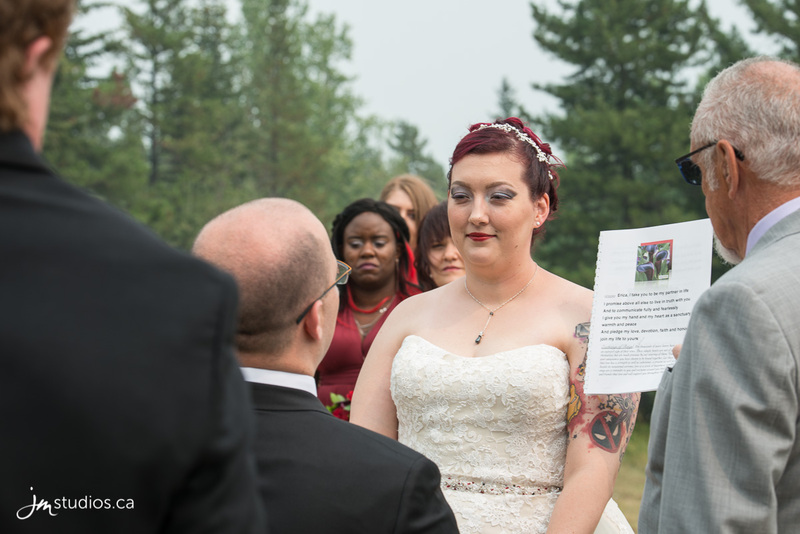 The couple stood together over the valley and shared their vows, and both of them managed to hold back the emotions during their heartwarming declarations of love! 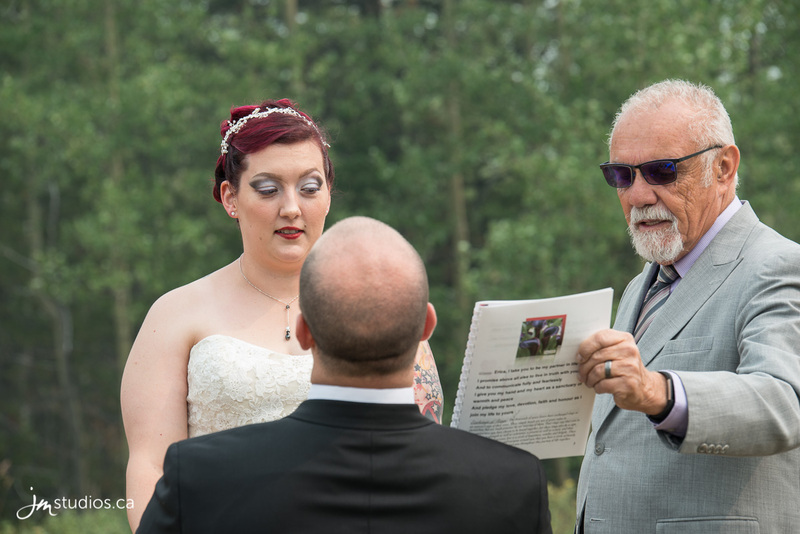 Jerry Stilson incorporated some of the children’s answers from earlier when he explained the importance of the little things in a marriage. 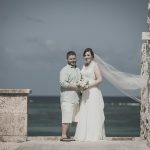 Sharing the rest of your life with someone is a huge commitment, and it is essential to hug every day to keep the connection strong. They wrapped up the ceremony by sharing their first kiss as Mr. and Mrs. Dornan! 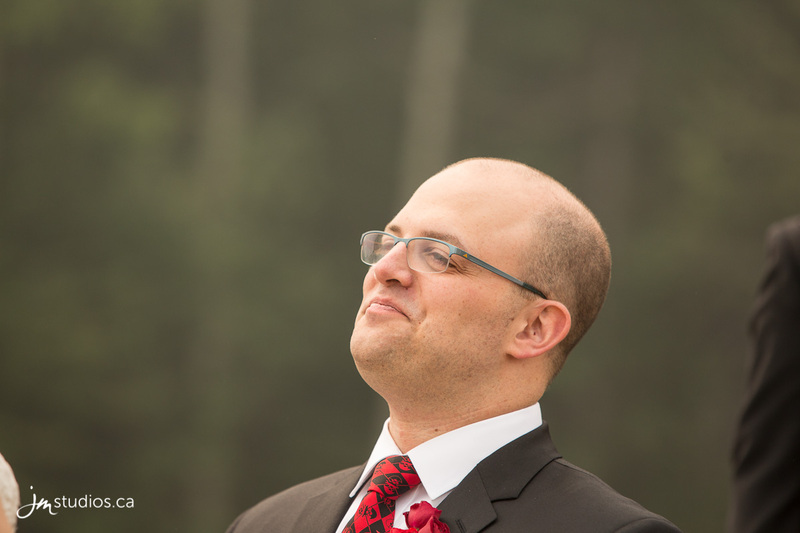 Due to the high volume of wildfire smoke in the Calgary area, the air quality has been poor as of late. 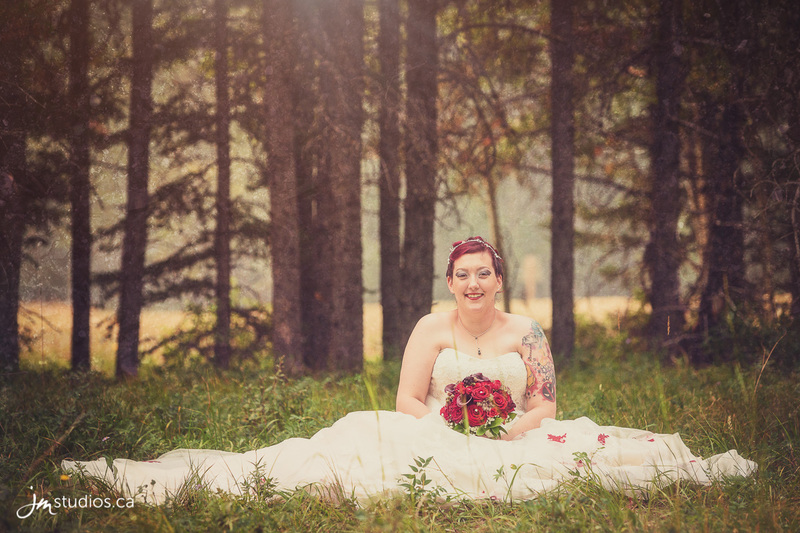 To save Erica’s ninety-year-old Nona from lingering outside, we rearranged the session to begin with family photos. 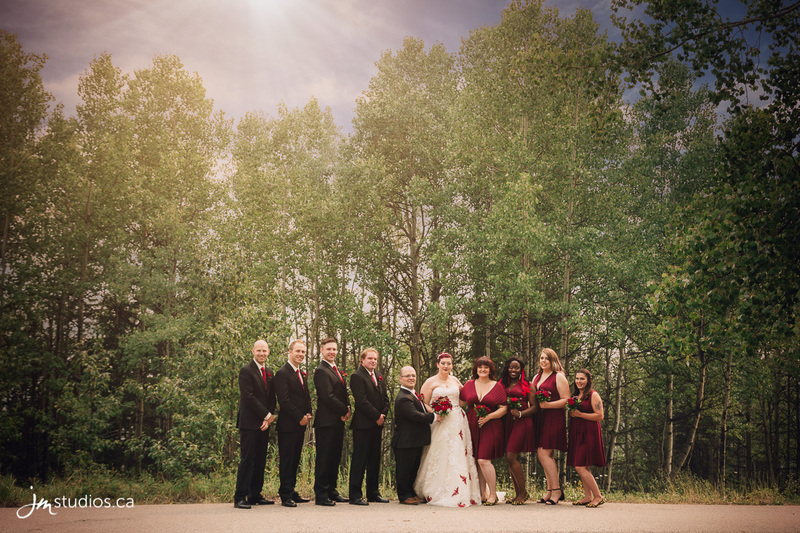 We moved through them quickly, and then gathered the wedding party for the creative formals! Even though the air quality in the area was poor, the smoke in the sky makes for amazing photographs. We began in a wooded area off of Viewpoint 5, where everyone got goofy, wearing big smiles across their faces. 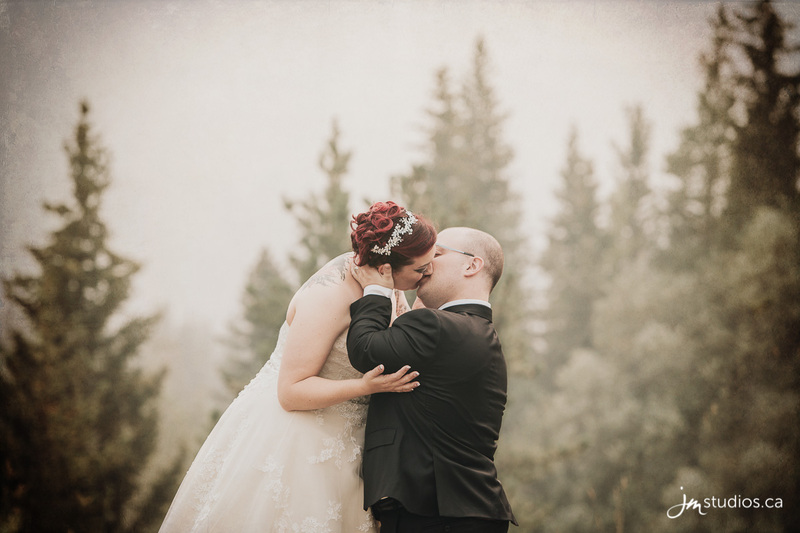 Next, we moved to the viewpoint overlooking Mount Kidd, where the incoming breeze had lifted some of the smoke so we could see the forest edging up the side of the mountain. 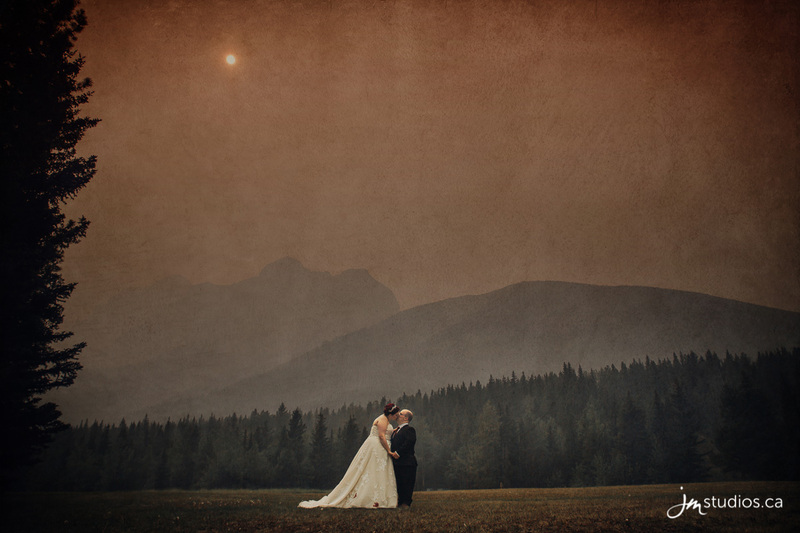 The sun was a brilliant orange, and the outline of smoky mountains fading into the background gave an incredible ambiance to the shots. 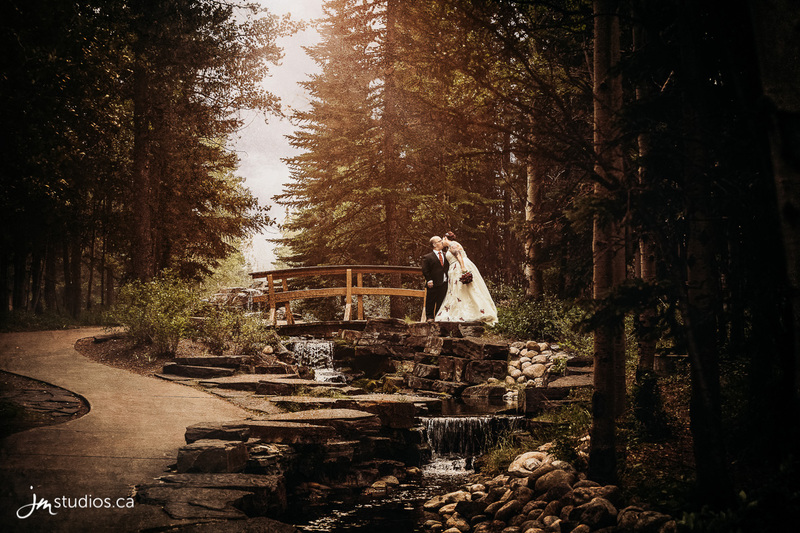 We separated with the newlyweds and wandered down the path at the Kananaskis Mountain Lodge, coming to a stop at the rock waterfall and pond in the central courtyard. 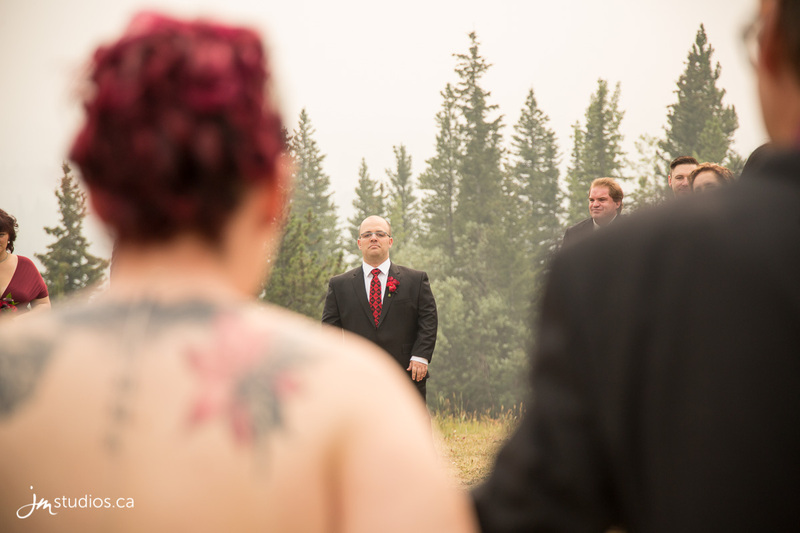 We photographed Erica and Stewart over the flowing water and then headed inside for a traditional sage smudging ceremony. 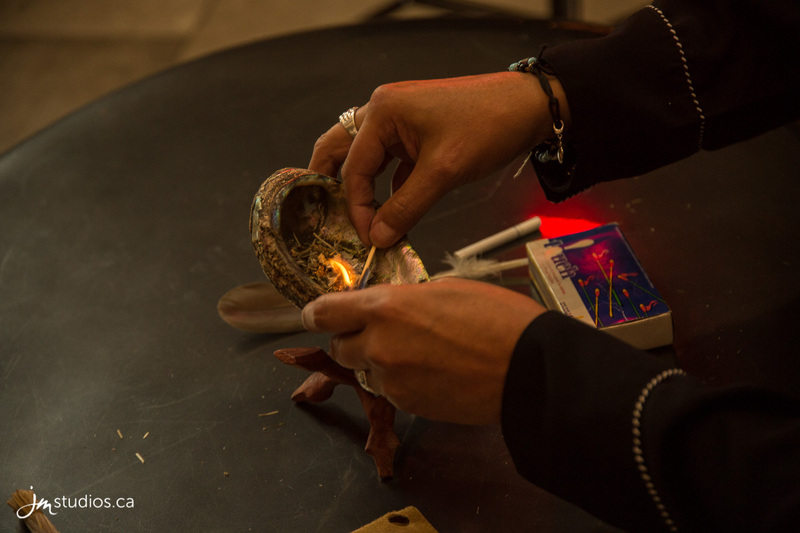 Smudging ceremonies find their roots in the many Indigenous cultures of North America, and this purification ritual purges negative energy, replacing it with positive vibes. 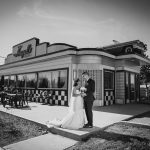 It’s a perfect way to begin a marriage. 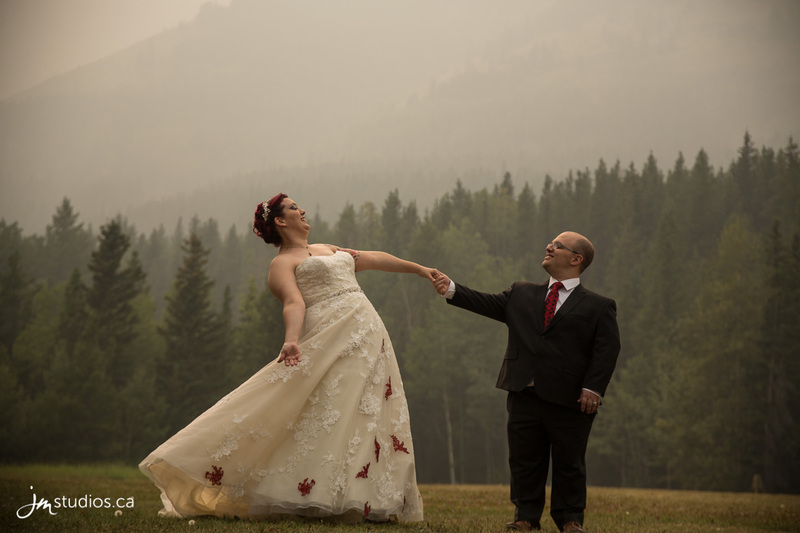 We moved indoors where the incredible staff of the Pomeroy Kananaskis Mountain Lodge went above and beyond to get everything set up. 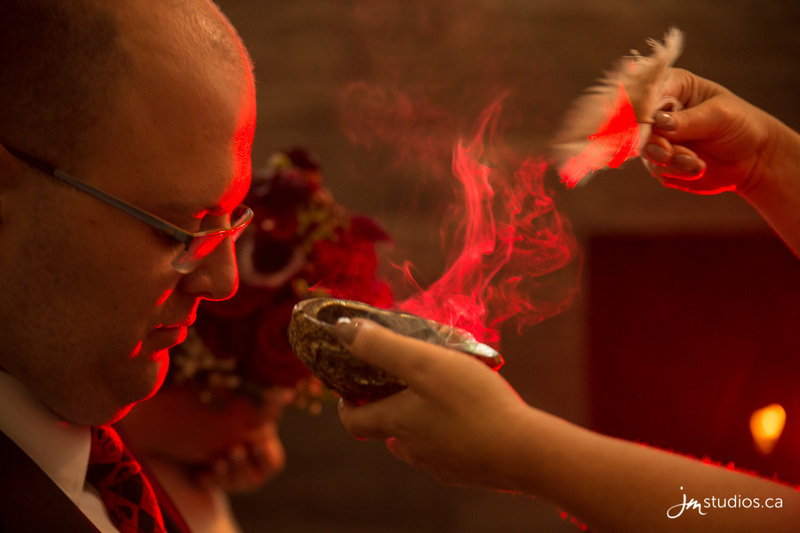 Erica and Stewart were joined by Stewart’s brother and his new wife, who were also taking part in the smudging. 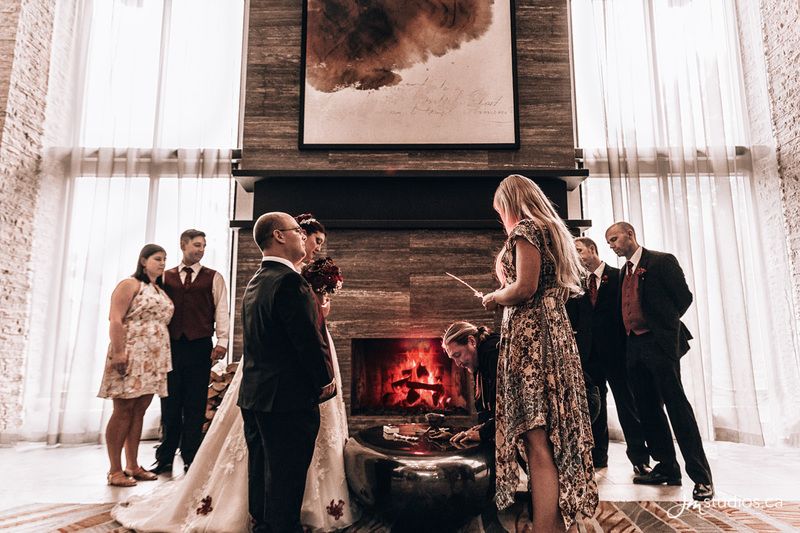 In front of the large wood burning fireplace in the lobby, their friend led the heartfelt and spiritual ceremony. 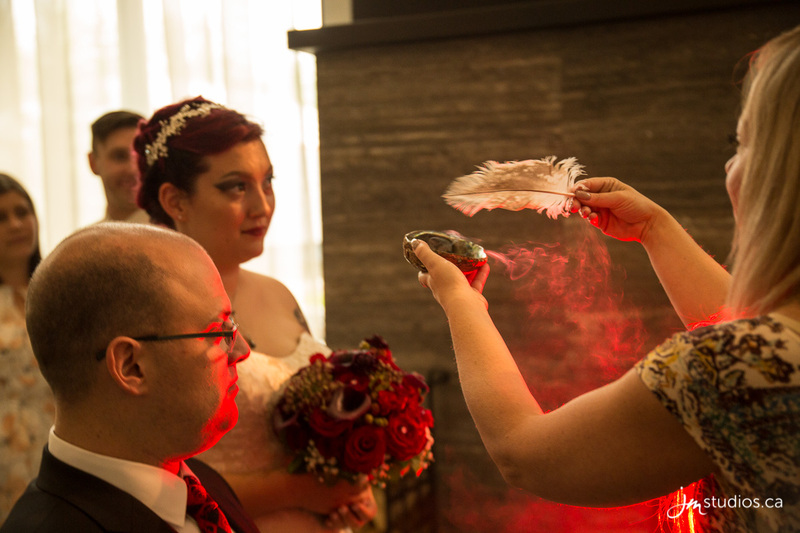 He explained the history and relevance of the ritual, and with sage and an eagle feather, he cleansed the newlyweds for their future life together. 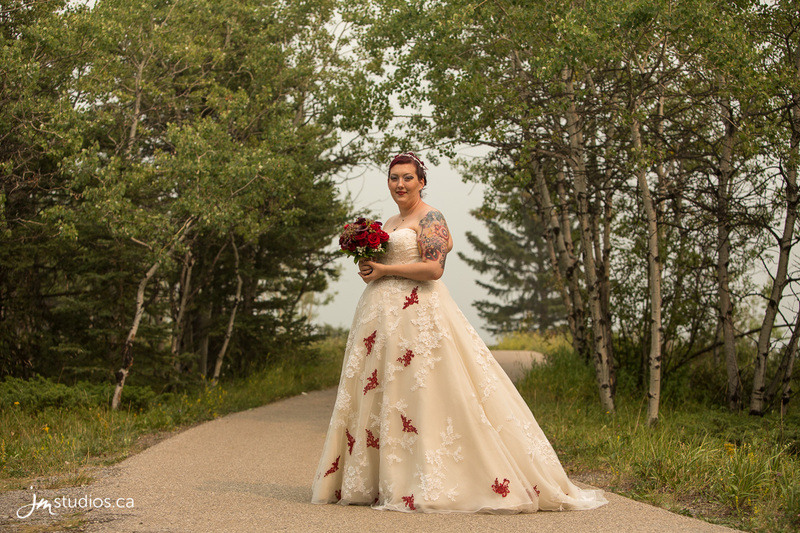 Because red is a prominent colour, not only in Erica and Stewart’s wedding but also in the First Nations culture, we set up a red gel to give the photos a unique hue. 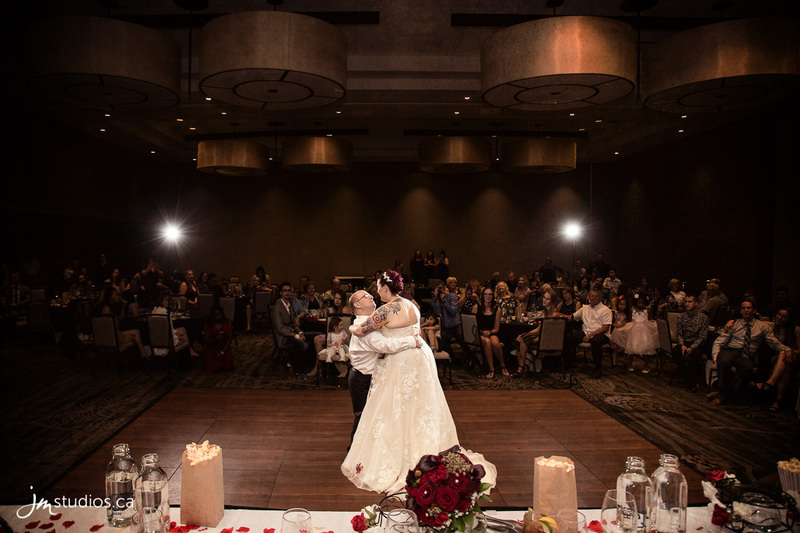 The reception was held in the Gold and Silver Ballrooms of the Pomeroy Kananaskis Mountain Lodge, two of the many gorgeous event spaces in the lodge. 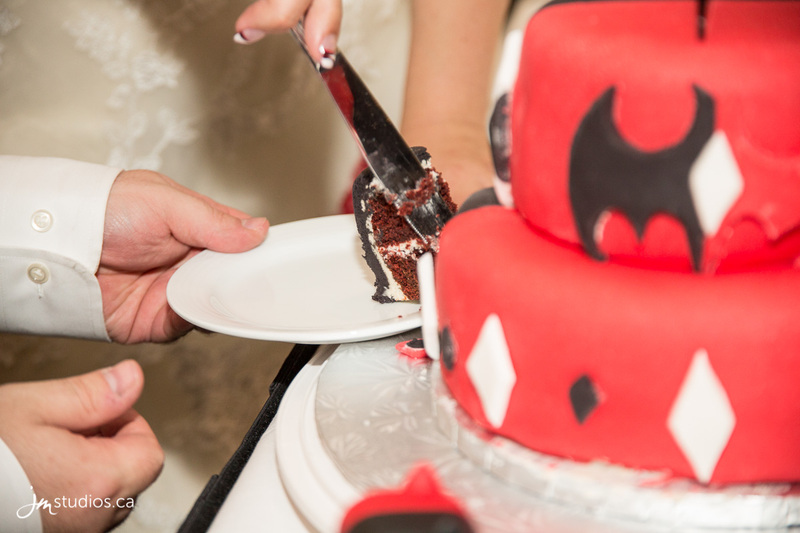 The tables were done up in a Harley Quinn and Batman theme, complete with Batman centrepieces. At the end of the night, the awesome centrepieces were given away via cards hidden under lucky guests chairs! 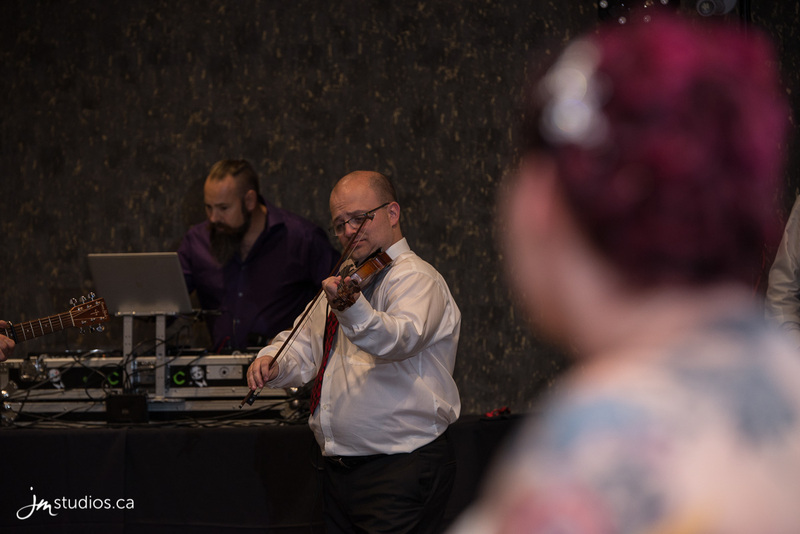 The talented emcee kept the guests entertained while Erica and Stewart were in their photo session. He was a natural, sharing anecdotes that were often humorous, captivating the audience as he spoke. He joked that when Stewart had asked him to be the emcee, he had replied “I’m no Superman, but I’ll see what I can do;” a cheeky reference to Erica’s love of comics. During his story there was a commotion in the kitchen. Suddenly, Batman emerged. One of Erica’s friends was kitted out in the full Batman gear, complete with a mask, body armour, and the Christian Bale Batman accent. He busted into the room, clearly agitated, searching for someone. 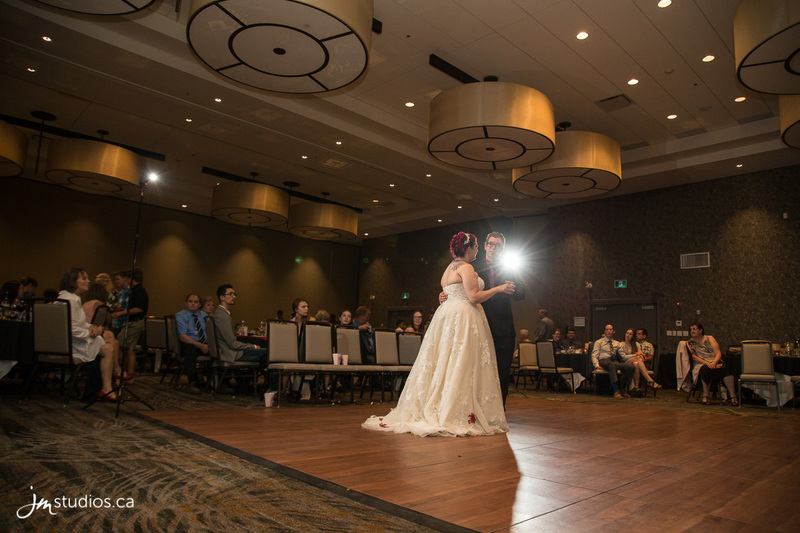 The emcee cautioned him; this was a private event, and he can’t just go around barging into people’s weddings. Batman walked over to the bar and slammed two drinks, and continued to storm the room. The emcee warned him again: if he didn’t leave, he would have to do something about. Batman laughed, and taunted him, asking what he could possibly do. So, the emcee stepped away from the podium and opened his dress shirt to reveal a Superman suit! He really was Superman! He and Batman squared off, until Batman withdrew kryptonite, rendering Superman helpless. A few of the friends ran up to collect him, carrying him out of the room. 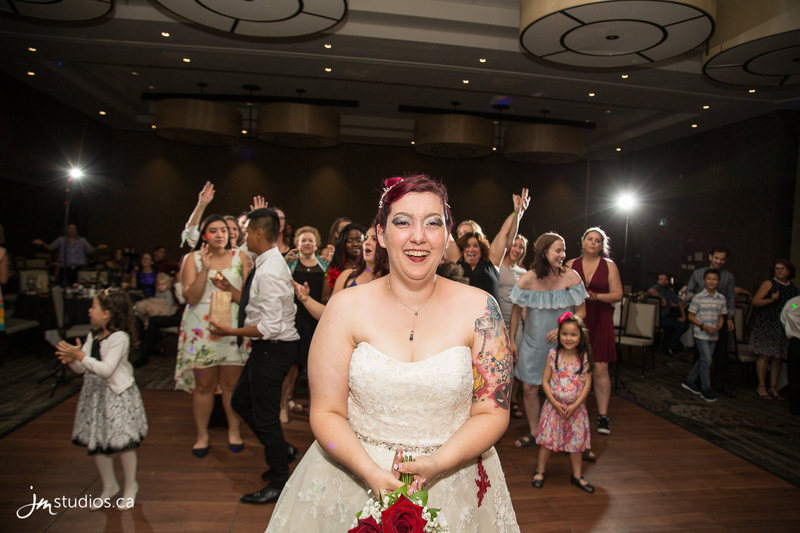 And with that hilarious transition, it was time to welcome the newlyweds! 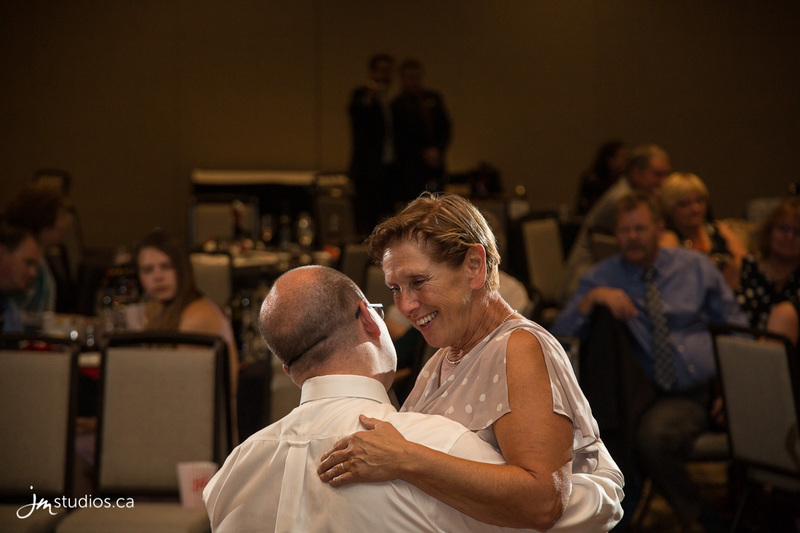 Stewart and Erica entered the high-energy room, and everyone sat down to enjoy dinner. For the starter, a salad station was set up, with bacon bits, parmesan croutons, and a delicious house-made caesar salad. For the mains, guests were treated to roast beef, with tasty horseradish sauce, chicken, garlic mashed potatoes, and steamed veggies. Speeches followed dinner, all beautiful and heartfelt. 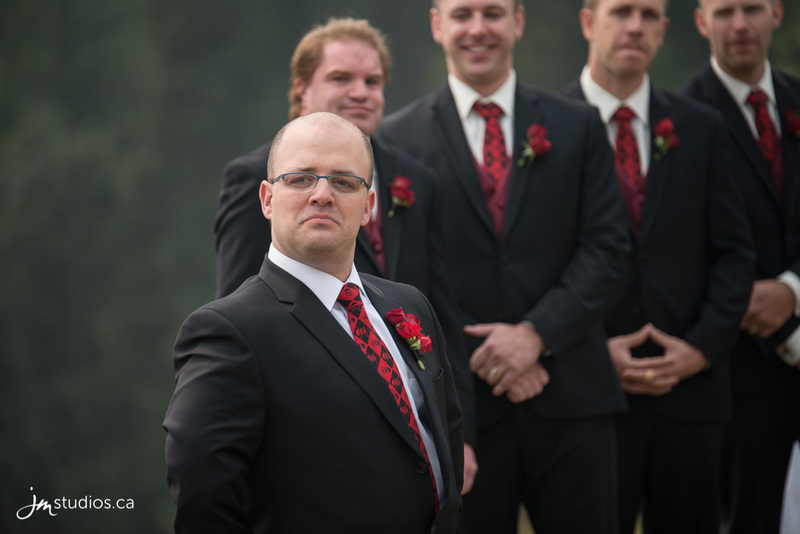 The groomsmen all spoke, offering testament to Stewart’s loving and caring nature. 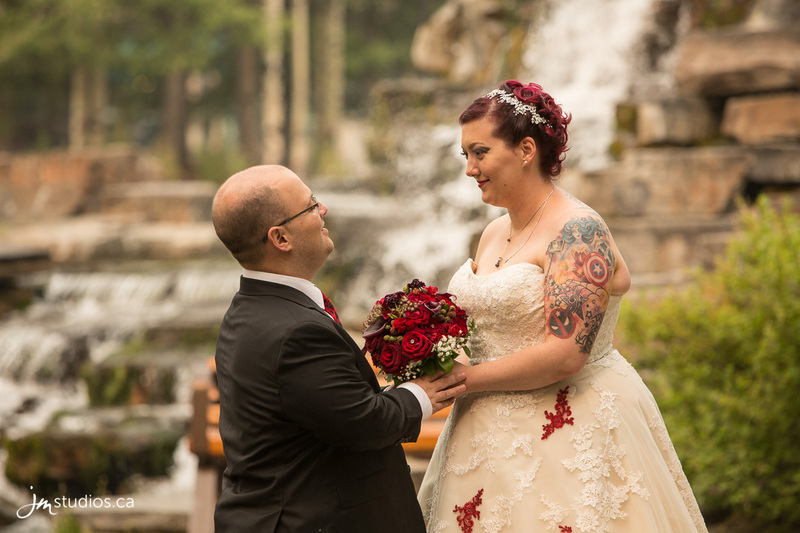 They mentioned that even though Stewart was never a comic book fan before meeting Erica, he has since embraced her passion for the medium, going so far as to include it in their wedding! 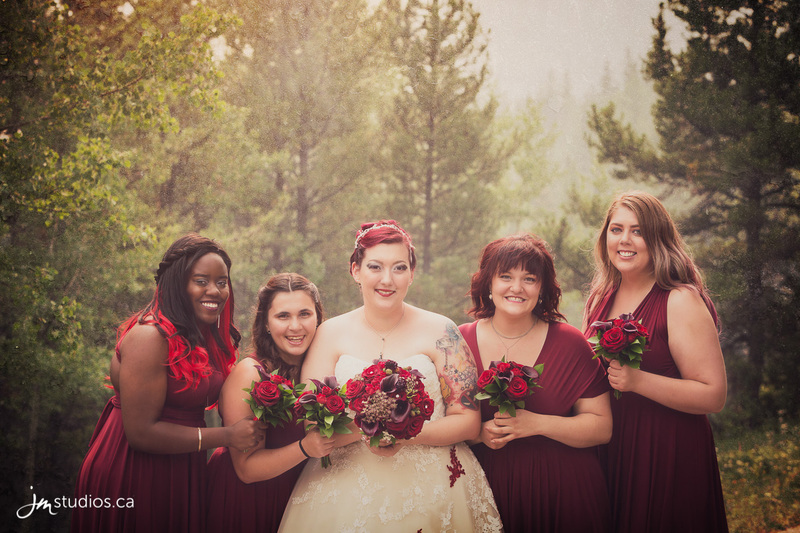 Erica’s bridesmaids also had beautiful things to say about the bride. She is a woman who brings love and light to each of their lives, spreading her infectious love of Marvel and DC in between a prank or two. 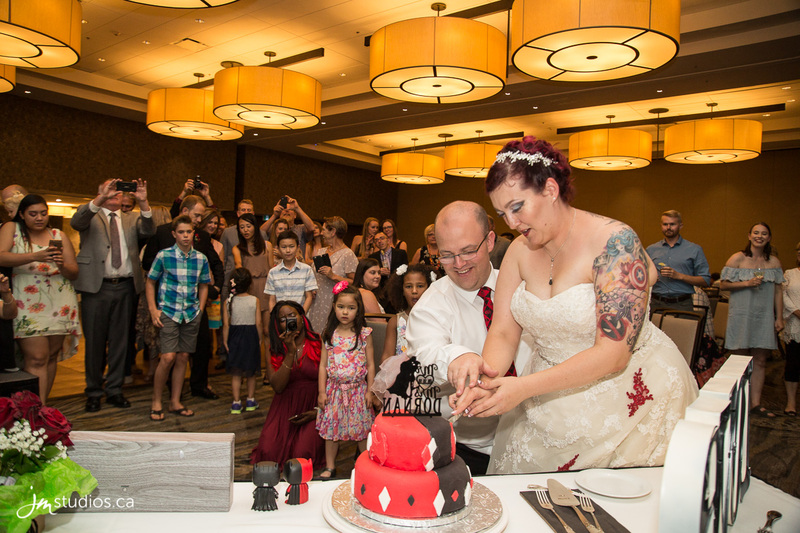 The parents welcomed each of their new family members into the clan, and then it was time for the cake cutting! Erica, who is quite the prankster, got Stewart with a piece of cake to the face. 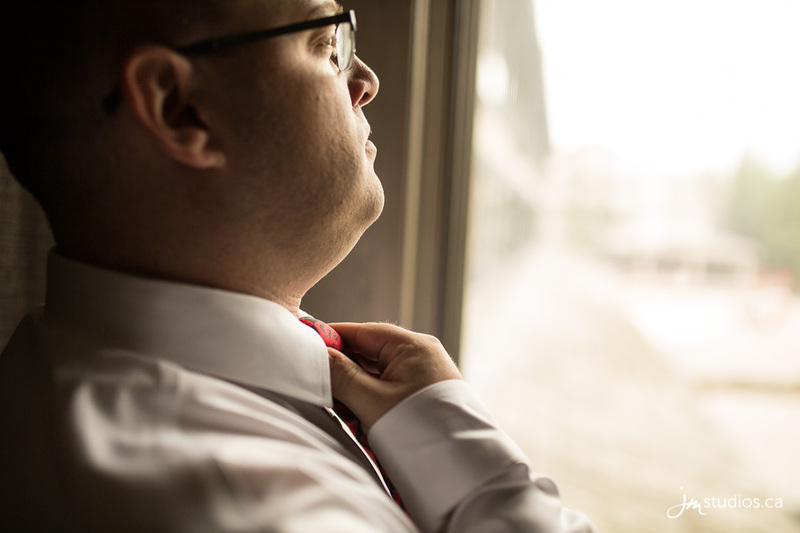 He laughed, joking that he wouldn’t need a knife and fork because it was payback time! Despite the threat and his competitive nature, he just couldn’t bring himself to do it. As much as he would have liked to get her back, he just couldn’t! 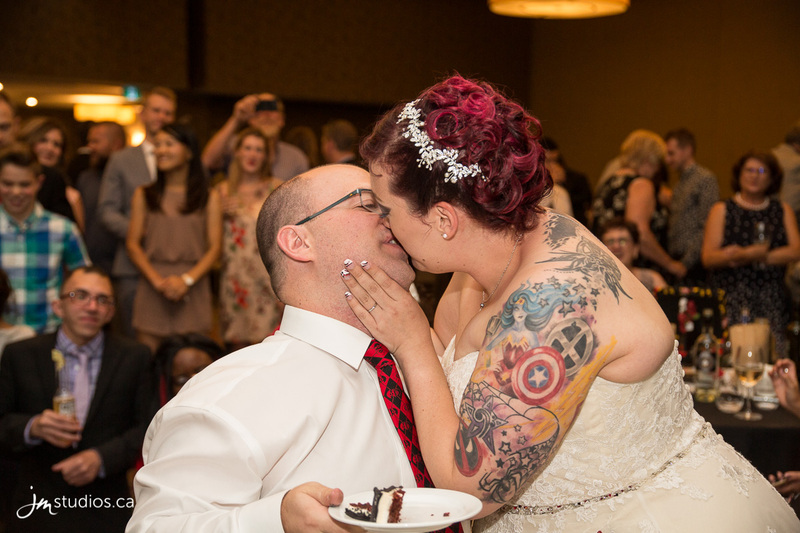 We followed the cake cutting with our same day slideshow, which proved popular with the guests! 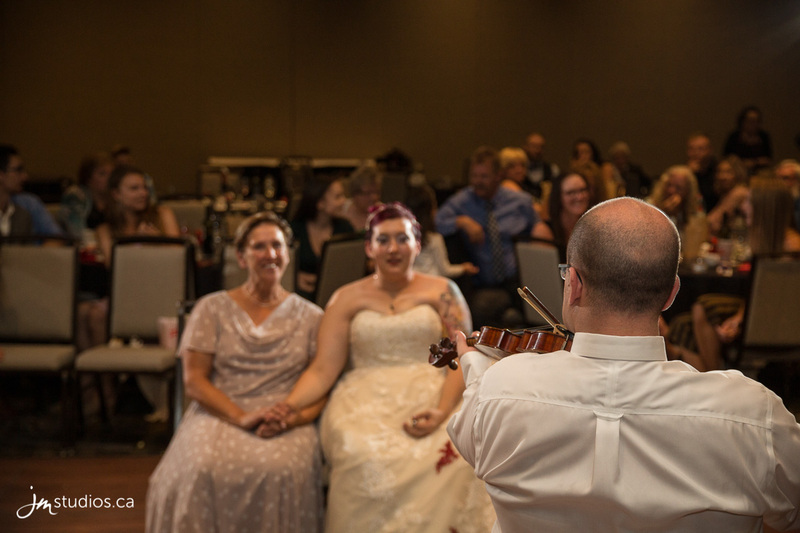 Erica and Stewart shared their first dance as a married couple to Ed Sheeran’s new song ‘Perfect.’ However, their song is ‘Beauty and the Beast,’ but instead of dancing to it, Stewart, a talented musician, joined up with his violin, friend on guitar, and the two played a duet for Erica. Then, later in the night, the Dornan’s shared a slow dance to the classic song. 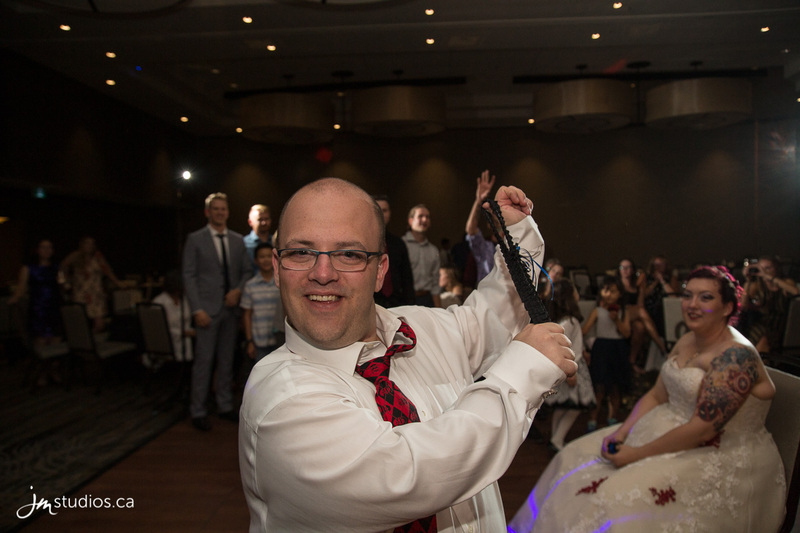 DJ Bernie from KISS Productions took it from there, playing music to keep the party going. While the guests were dancing, we took a group outside to the firepit in the courtyard. 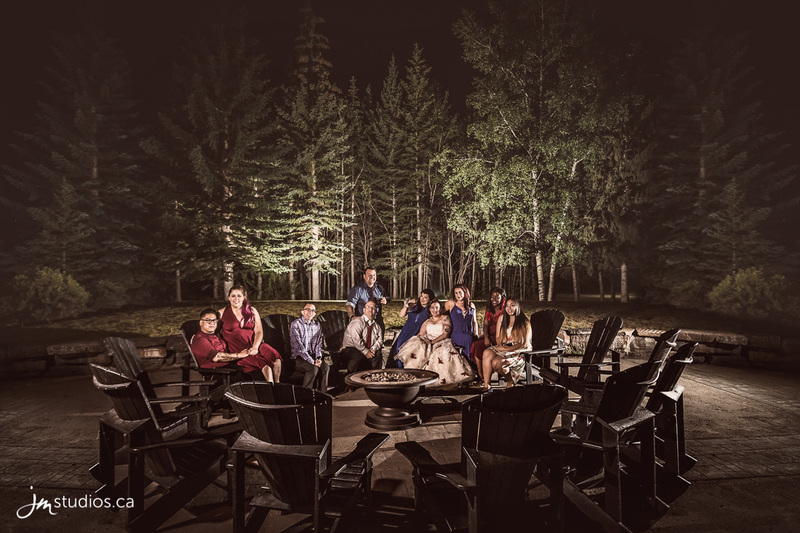 Because of the seasonal fire ban, we weren’t able to ignite it, but using some creative lighting, we got some great shots of the guests and the newlyweds sitting around the pit and sharing a chat. 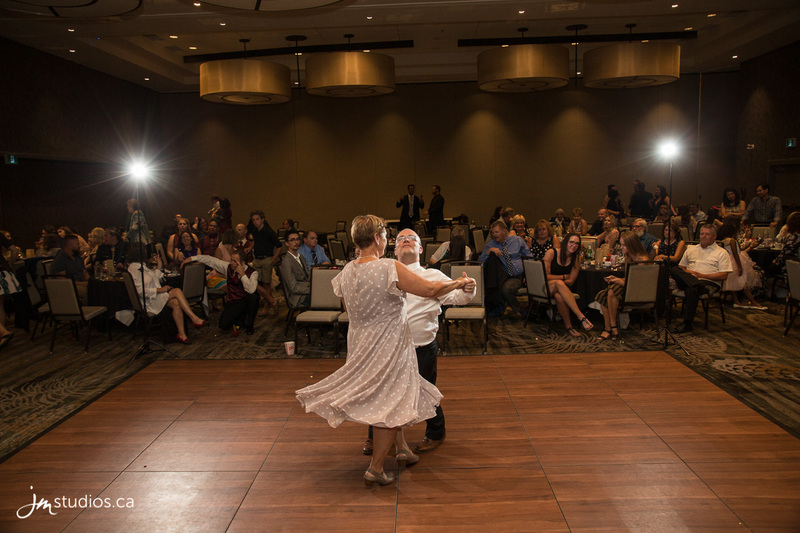 The cool evening temperatures were a nice departure from the warmth of the dance floor, so we lingered for a while, taking in the beautiful evening of Erica and Stewart’s wedding.